We are proud to celebrate our student-athletes' successes in the classroom as much as we do on the field. 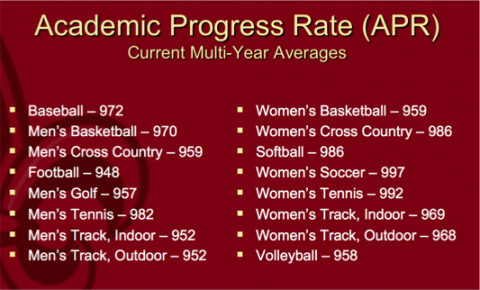 We provide academic support and resources through the Student-Athlete Academic Center. Louisiana Ragin' Cajuns student-athletes graduate at the highest rate among student-athletes in schools in both the state of Louisiana and the Sun Belt Conference, according to the Federal Graduation Rates (FGR) statistics. According to most recent data, 75 percent of Ragin' Cajuns student-athletes graduate within six years. All sports exceed the newly revised APR benchmark of 930 that is required for postseason competition (increased APR standards will not be fully implemented until 2015-16). Louisiana Ragin’ Cajuns earn fleur-de-lis helmet decals for athletic and academic achievements. On black helmets, gold decals signify academic success, while red stickers tout athletic accomplishments.